Crys Matthews is nothing if not ambitious. In August 2017, she simultaneously released both a new full-length album, The Imagineers and an EP, Battle Hymn for an Army of Lovers. These collections showcase two sides of Matthews’ dynamic songwriting: The Imagineers is a selection of thoughtful songs about love and life; Battle Hymn for an Army of Lovers tackles social justice themes. Songs from both projects have already won her recognition and awards. She was one of ten finalists (from a pool of 5,000) in the 2017 NewSong Music and Performance Competition and, after performing at Lincoln Center on November 30th, she was named grand-prize winner. The win earned her the opportunity to perform twice at Sundance Film Festival’s ASCAP Music Cafe in Park City, UT in January. Matthews also won the People Music Network’s Social Justice Songs contest at the 2017 Northeast Regional Folk Alliance, and was selected as an official showcase artist at Folk Alliance International 2018 along with Dar Williams, Mary Gauthier, and Natalia Zuckerman to name a few. Matthews blends Americana, folk, jazz, blues, bluegrass and funk into a bold, complex performance steeped in traditional melodies and punctuated by honest, original lyrics. 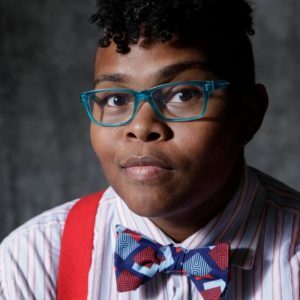 Having been compared to everyone from Toshi Reagon to Tracy Chapman to Ruthie Foster, Matthews’ eclectic infusion of genres has won her honorable mentions at the 2017, 2014 and 2013 Mid-Atlantic Song Contest and extensive radio play from Woman of Substance radio to WTJU-Charlottesville and WMRA-Harrisonburg to KBOO-Portland. Equally at home in an acoustic listening room as she is on stage at large music festivals, Matthews has quickly gathered a loyal following on the east coast playing such prestigious venues as The Birchmere, The Hamilton, and Jammin’ Java. Matthews’ festival and showcase roster has included the Sundance Film Festival, BMI’s Island Hopper Songwriter Festival, the 40th Michigan Womyn’s Music Festival, Folk Alliance International, 30A Songwriters Festival, Northeast Regional Folk Alliance and many more.